Chita is a Russian city nestled between Mongolia and Manchuria. Although Chita is located on the trans-siberian railway, I wonder if it is more energy efficient to ship 100 tons of cut beef every day by air, assuming that, for five months a year, no fridge is needed. Air is much more energy intensive. Gucwa and Schaefer looked at the impact of scale on energy intensity in freight transportation, and the chart below is taken from that paper. They looked at varying loads, across four modes - the line in the lower left is trucks, the cluster above it is air, the long spread-out light grey dots in the bottom-right is ships, and the small dark cluster just below ships, centred around an average load of 1000 tonnes, is rail. The y-axis is the energy intensity: how much energy is required to move one tonne, one kilometre. 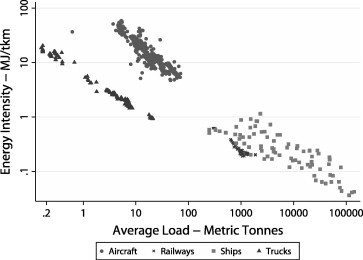 As you can see, rail-freight is much lower on the chart than air freight: (NB both axes are logarithmic). Air is 10-100 times more energy-intensive than rail. Add in all the additional environmental costs of air travel, and compare with the simplicity of decarbonising rail travel, and rail is a clear winner. This doesn't include the comparative energy costs of refrigeration, nor the impact of any differences in weight of packing materials. I thought about looking at your problem focusing on airships, not airplanes, as they've been very much in vogue lately. I found this opinion piece at Scientific American. It discusses efficiency of various transportation models, and it affirms the other answer that train is definitely better than air! If you're looking to transport from somewhere inaccessible from normal ground transport, though, airships might be a viable alternative. Not the answer you're looking for? Browse other questions tagged energy food transport or ask your own question.